Հոկտեմբերի 18-ի երեկոյան ոստիկանության տեղի ղեկավարի դուստր 17-ամյա Մելիսա Սմիթը անհետացավ փոքրիկ մորմոնական քաղաք Միդվեյլում՝ Սոլթ Լեյք Սիթիի ևս մեկ մերձքաղաքային շրջանում: Նա անհետացել էր, երբ տուն վերադառնալիս էր եղել պիցերիայից: Մելիսա Սմիթը եկել էր իր տնից կես կիլոմետր հեռավորության վրա գտնվող պիցերիա, որպեսզի խոսեր այնտեղ աշխատող իր ընկերուհու հետ, ում լքել էր ընկերը: Հանգստացնելով ընկերուհուն՝ մոտավորապես ժամը 22-ին նա ուղևորվել էր տուն: Ինը օր անց նրա մերկացած մարմինը գտել էին Summit Park-ի շրջանում՝ Ուոսաթչ լեռներում՝ Սոլթ Լեյք Սիթիից 30 կիլոմետր հեռավորության վրա: Դիահերձումը ցույց էր տվել, որ նա ողջ էր եղել անհետացումից հետո 7 օր շարունակ: Դեկտեմբերի 31-ի գիշերը Լիհայ քաղաքից 35 կիլոմետր հեռավորության վրա սրճարանից անհետացել էր 17-ամյա Լորա Էն Էյմը: Նրա մարմինը հայտնաբերել էին զբոսաշրջիկները յոթ օր անց՝ Երախտագիտության օրը Ամերիքան Ֆորք Կանյոնում, որը գտնվում է Վինթեր Ուոսաթչ Քեշ ազգային արգելավայրում։ Երկու կանայք էլ դաժանորեն ծեծվել էին, բռնաբարվել, խեղդամահ էին արվել նեյլոնային զուգագուլպաներով: Մի քանի տարի անց Բանդին նկարագրել է այն սովորույթները, որոնք նա անցկացնում էր արդեն մահացած աղջիկների հետ. նա լվանում էր նրանց մազերը շամպունով և դիմահարդարում էր. Մահապատժի նախորդ երեկոյան նա Հագմայերին խոստովանել էր հետևյալ սպանությունների մեջ. Սանդրա Ջին Ուիվեր, 19 տարեկան. ↑ «Evans’ man followed Rosy», Ellensburg Daily Record (from UPI), Aug. 30, 1973. Jenkins J. P. Ted Bundy // Britannica. Архивировано из первоисточника 8 Մայիսի 2016. Kendall, Elizabeth (Elizabeth Kloepfer). The Phantom Prince: My Life with Ted Bundy (անգլ.). — Madrona Pub., 1981. — ISBN ISBN 978-0-914842-70-5. Keppel, Robert. The Riverman: Ted Bundy and I Hunt for the Green River Killer (անգլ.). — Pocket Books, 2005. — ISBN ISBN 978-0-7434-6395-9. Larsen, Richard W. Bundy: The Deliberate Stranger (անգլ.). — Prentice Hall, 1980. — ISBN ISBN 978-0-13-089185-3. Michaud, Stephen; Aynesworth, Hugh. Ted Bundy: Conversations with a Killer (անգլ.). — Signet, 1989. — ISBN ISBN 978-0-451-16355-4. Michaud, Stephen; Aynesworth, Hugh. The Only Living Witness (անգլ.). — Authorlink, 1999. — ISBN ISBN 978-1-928704-11-9. Nelson, Polly. 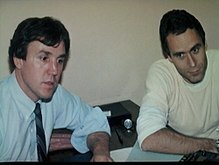 Defending the Devil: My Story as Ted Bundy’s Last Lawyer (անգլ.). — William Morrow, 1994. — ISBN ISBN 978-0-688-10823-6. Rule, Ann. The Stranger Beside Me (անգլ.). — Signet, 2000. — ISBN ISBN 978-0-451-20326-7. Sullivan, Kevin M. The Bundy Murders: A Comprehensive History (անգլ.). — McFarland and Co., 2009. — ISBN ISBN 978-0-7864-4426-7. Winn, Steven; Merrill, David. Ted Bundy: The Killer Next Door (անգլ.). — Bantam., 1980. — ISBN ISBN 978-0-553-20849-8.